Earn Money for Rosedell at NO COST TO YOU!!! You can find BOX TOPS on thousands of your favorite products, from Big G® cereals to Avery® office supplies to Hanes® T-shirts to Boise® printer paper. Each Box Top is worth 10 cents to the school, which can add up quickly! 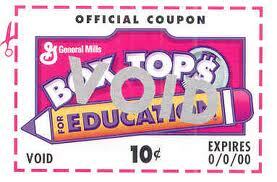 Also, be aware that oftentimes there are bonus box tops that will be printed from the register. 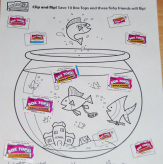 ​​Clipping and turning in Box Tops is such an easy way for families to get involved in their child's education. Every item turned in helps the school to earn money. Just by purchasing products such as soup, cereal, granola bars, printer paper, school supplies, fruit snacks and more, then clipping the coupons and sending them in to school, we earn CASH for Box Tops (10 cents each)!Throughout the year we have several contests, so start collecting now and be ready for our next contest! Last year we earned $2,829.50 and used the cash to provide Smart Boards for several classrooms for our students, and many field trips to the PAC center some truly fantastic performances! This year (2017-2018) our goal is $3,500 and we plan to use the cash to pay for more field trips, special events at Rosedell, and much more! It is easy to collect and turn in Box Tops. You can glue them to a collection paper (10 per paper meaning each paper is worth $1). Or, you can simply collect them in a plastic baggie and just turn that in with a paper stating the number of box tops that are enclosed. If possible, please trim your box tops. Families, we are asking for you to continue to turn in every Box Top you can, and ask grandparents and coworkers and whomever you think that may be able collect them for us. For those that remember, they are like green stamps and blue chip stamps :-) Box tops are on many items, including General Mills cereals, Kleenex brand tissues, Avery labels, Gold Medal flour, various fruit gummies, and more. Please check the website for more items.